our perfectly imperfect life: Mason's "Jent"
Mason has been playing with a little metal fighter jet lately ... only he calls it a "jent". We have told him over and over that it is called a "jet", not a "jent" ... but he clearly doesn't care. Somewhere along the way, he decided we were going to build a big "jent" ... and so we did. I got out a cardboard box, drew a jet and used a box cutter to cut it out. Mason decided that his "jent" needed to be red (his favorite color), so we glued red paper to it. Mini Gatorade bottles served as our engines; pistachios as our guns; Gatorade caps as our wheels; and jingle bells on the wings so people would know we were coming, of course. 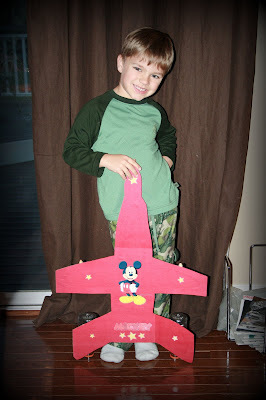 Mason wanted to decorate his "jent" with Mickey Mouse stickers, thus our jet's name ... "Air Force Mickey". Mason has not stopped playing with his "jent" since we made it. Shoot, if I would have known that a homemade toy would go so far, we would have started doing this a long time ago! Good grief. Is there anything you can't do!?!? I mean seriously- that is insane talent right there! Thanks for coming to visit our blog. Congrats on the adoption of Nika. All three of you kids are so CUTE!!! I have been one of those blogger stalkers that reads the blog and doesn't comment, so yeah, I've been following dreaming on an angel for a while! So glad to hear everything is going well for you. Looking forward to meeting you at the convention in July! I love that you named it Air Force Mickey!!! Love his Jent!!!! Our favorite toy ever is the box our grill came in. The kids play with it for hours! Wow, how creative! I'm completely clueless at stuff like that! Pretty awesome! ahh did you have to "make" a toy because poor Mason doesnt have any ds games??? Wow, that's awesome! I hope I can come up with stuff like that one day instead of buying one. It looks amazing, and a great way to recycle! Tell your little guy his "jent" has inspired other kids in Canada! Geez! I had almost as many blog posts from you to catch up on as Renee G.! LOL! You're catching up to the blogging queen! ROFL! !